The European Union's objective is, inter alia, to provide citizens with a high level of safety within an area of freedom, security and justice by developing common action among the Member States in the field of police mutatis mutandis in connection with other international cooperation as laid down under Title V of the Treaty on the Functioning of the European Union. On 21 June 1999 the Council adopted a Resolution concerning a handbook for international police cooperation and measures to prevent and control violence disturbances in connection with international football matches (1). This Resolution was first replaced by the Council Resolution of 6 December 2001 and later on by the Council Resolution of 4 December 2006 concerning a handbook with recommendations for international police cooperation and measures to prevent and control violence and disturbances in connection with football matches with an international dimension, in which at least one Member State is involved (2). The current Resolution suggests that amendments to the handbook be proposed in the light of recent experience. Taking into account experience in recent years, such as the World Cup 2006 and the European Championships in 2008 and the experts' assessment of international police cooperation in the framework of those tournaments as well as extensive police cooperation in respect of international and club matches in Europe generally and comparable developments and experiences in respect of other sporting events with an international dimension, the handbook annexed to the aforementioned resolution of 4 December 2006 has been revised and updated. The Council requests Member States to continue to further enhance police cooperation in respect of football matches (and, where appropriate, other sporting events) with an international dimension. To that end, the updated handbook annexed hereto provides examples of strongly recommended working methods that should be made available to the police. This Resolution replaces the Council Resolution of 4 December 2006. (1) OJ C 196, 13.7.1999, p. 1. (2) OJ C 322, 29.12.2006, p. 1-39. The purpose of this document is to enhance safety and security at football matches with an international dimension, and in particular to maximise the effectiveness of international police cooperation. The content, where appropriate, can also apply to other sporting events with an international dimension. The content is without prejudice to existing national provisions, in particular the competencies and responsibilities of the different agencies within each Member State. Although this document is mainly focused on international police cooperation, in view of the multi-agency character of managing football (and other sporting events), there are references to police interaction with other key partners such as the event organiser. International police cooperation and football policing operations must be guided by the principles of legality and proportionality. Examples of good practice are detailed at Appendix 1. Whilst the competent authority in the organising Member State is responsible for providing a safe and secure event, authorities in participating, neighbouring and transit states have a responsibility to assist where appropriate. This document should be widely disseminated and applied in each Member State and other European countries and beyond in order to minimise safety and security risks and ensure effective international police cooperation. The timely exchange of accurate information is of the utmost importance in enhancing safety and security and preventing football-related violence and disorder. In accordance with Council Decision 2002/348/JHA, each Member State must establish a National Football Information Point (NFIP) to act as the central and sole contact point for the exchange of relevant information for football matches with an international dimension, and for developing international police cooperation concerning football matches. Where there is direct contact between organising and visiting police, any information exchanged shall be shared simultaneously with the relevant NFIPs. Such contact shall not jeopardise the key role of the NFIP in ensuring the quality of the information and wider dissemination to other relevant partners and authorities. The relationship between the NFIP and the competent national authorities shall be subject to the applicable national laws. NFIP personnel are trained and equipped to provide a national source of expertise regarding football policing and associated safety and security matters. NFIPs shall work on the basis of equivalence. The NFIP shall support the competent national authorities. On the basis of information that has been analysed and assessed, the necessary proposals or recommendations will be sent to the competent national authorities to assist in developing a multi agency policy on football related issues. The NFIP shall support local police with regard to national or international football matches. For the benefit of NFIPs of other countries, each NFIP shall maintain an updated risk-analysis (1) related to its own clubs and its national team. The risk analysis is generally shared with other NFIPs using the forms available on the NFIP website (www.nfip.eu) (2). Each NFIP shall have access to the relevant national police databases. The exchange of personal information is subject to the applicable national and international law, especially the Prum Council Decision (3) or bi-national or multi lateral agreements. The NFIP shall ensure that all information is subject to quality control in respect of content. The NFIP can, if appropriate, extend this exchange of information to other agencies which contribute to safety and security. All information shall be exchanged using the appropriate forms provided on the NFIP website. A distinction can be made between general information and personal information. The term ‘event’ is used to mean a specific football match or tournament in all its aspects. tactical information: information that assists the person in charge at the operational level to respond appropriately to safety and security issues during the event. In this context, personal information refers to information on individuals who are assessed as posing a potential risk to public safety in connection with the event. This may include individuals who have previously caused or contributed to violence or disorder in connection with football matches. Three phases may be distinguished: before, during and after the event. These three phases need not always be strictly separated. The NFIP of the organising country shall provide information on the applicable legislation and policy of the authorities (e.g. alcohol policy) the organisation of the event and key safety and security personnel. All relevant information shall be put at the disposal of the other NFIPs concerned and entered on the NFIP website via the appropriate forms. , the NFIP of the supporting country / countries shall be requested to provide timely and accurate information regarding the movements of risk and non-risk supporters, the participating team (where there is a threat) and ticket sales, together with any other relevant information. The NFIP of the organising country shall provide information to the NFIP of the supporting country (countries) in particular regarding the integration of the visiting police delegation into the organising country policing operation and information for visiting supporters, etc. , the NFIP of the organising country can request confirmation of the information previously provided and request an updated risk analysis. The request shall be forwarded and answered via a system of liaison officers if such a system has been set up. , the NFIP of the organising country shall provide feedback on the accuracy of the information provided. General information regarding the return of supporters including any that have been expelled and/or refused entry shall also be provided to the NFIPs of the country of origin and the relevant transit countries. on the operational usefulness of the information they have provided and of the support of the visiting police delegation(s) (see Chapter 2). The NFIP of the supporting country / countries shall respond to the information requirement of the organising country NFIP and, on its own initiative, provide all relevant information to any other NFIPs concerned. The information supplied shall be updated and the movements and stay of the supporters shall be monitored. Useful information concerning event related incidents in their home country during the matches or tournaments shall also be provided to the organising country and any other relevant NFIP. Based on the information provided by the organising country NFIP and the visiting police delegation the risk analysis shall be updated (see Chapter 2). An assessment shall be carried out concerning the information exchange and the work of the visiting police delegation. At the national level the NFIP shall coordinate the exchange of information regarding football matches and where appropriate, coordinate and organise the training and work of intelligence officers and / or spotters. NFIPs shall be the channel for the exchange of information with non-EU countries. If these countries do not have an NFIP they should be asked to indicate a central, single contact point. Contact details should be forwarded to other NFIPs and entered on the NFIP website. At the national level the NFIP shall act as a knowledge centre. In addition to the police, civil servants and academics could contribute to the role of the NFIP as a knowledge centre. An NFIP can enter into a formal bilateral agreement with a third party regarding the exchange of certain information in accordance with their own national legislation. This information shall not be further shared without the agreement of the originator. the NFIP of the organising country shall communicate with the NFIP of the supporting country / countries via the designated national liaison officer where appointed. the NFIP of the organising country shall communicate with the NFIP of the supporting country through the designated liaison officer or Operations Coordinator of the country. In respect of matters such as counter-terrorism and serious and organised crime the organising country NFIP or the competent police agency shall communicate through any existing network or specialist liaison officers appointed for that purpose. If a local football information centre exists, it shall cooperate with the NFIP. The local information centre and NFIP shall keep one another informed. This information flow should take into account information provided by the visiting police delegation. Efficient event preparations by the police in the organising country will be supported by a comprehensive exchange of information, in accordance with the principles which are to be found in chapter 1 of this handbook. The organising NFIP, following close consultation with their police, should invite a visiting police delegation from countries that can contribute added value. This added value should be considered in the light of a number of factors such as professional experience in managing the behaviour of visiting supporters including risk supporters and the ability to provide the organising police with information designed to minimise risks to public order. The organising NFIP can also invite police officers who are seeking to gain experience as a member of a visiting police delegation, enabling them to provide added value at football matches involving their supporters in the future. In accordance with Council Decision 2002/348/JHA, for one-off football matches with an international dimension, the formal invitation for a visiting police delegation shall be transmitted via the NFIP in the organising country, who will receive advice from the police concerned. Taking into account the specific aims of cooperation, the invitation should indicate the composition of the delegation and clarify their roles and responsibilities. It should also specify the intended duration of the visiting police delegation’s time in the organising country. For international tournaments and one-off matches (should either NFIP request) the formal invitation for a visiting police delegation shall come from the Ministry responsible in the organising country, on the advice of the organising country NFIP, and can be subject to an inter-governmental agreement. If a visiting police delegation is not invited by the organising NFIP, the NFIP of the sending country can, if deemed appropriate, submit a proactive proposal to the organising NFIP to send a delegation. If the organising NFIP does not accept the proposal, any police delegation that still travels is acting in an unofficial capacity outside of the scope of this handbook. The detail of the arrangements (e.g. police powers, equipment, uniforms etc.) concerning the visiting police delegation shall be agreed through negotiation between the respective NFIPs, following consultation with the local police for the one-off match. If a bi-national governmental agreement is not in place, these arrangements shall be in compliance with Article 17 of the Council Decision 2008/616/JHA (5) and the national laws applicable. The visiting delegation must not exceed the number agreed by the organising NFIP and must respect the organising police command and control arrangements. If they act in a manner that is not within the terms of the agreement then they are acting outside of the scope of this handbook and the applicable EU Council Decisions and Treaties. The detailed invitation for support shall be agreed between NFIPs concerned well in advance of a tournament and/or one-off match to allow the visiting police delegation sufficient preparation time. In that context, an invitation for support should be presented as soon as possible after the announcement of the date of the match. For one-off matches with an international dimension the visiting police delegation will require at least 3 weeks’ preparation time. If there is less than 3 weeks prior notice of a match (for example in the later stages of a European club competition or due to an increased level of risk) the invitation shall be sent immediately. For international tournaments, the visiting police delegation requires at least 16 weeks’ preparation time. On each occasion the organising country shall pay for accommodation, meals (or subsistence) and other facilities made available locally whilst the visiting country shall pay for travel and salaries of the delegation members involved. Exceptionally, the respective NFIPs can agree on alternative arrangements. These arrangements need to be clarified in the Protocol for deployment of visiting police delegations, as available on the NFIP-website. The police in the organising country shall provide an opportunity for key members of the visiting police delegation to acquaint themselves with the organisation of police operations in the organising country and/or the venue town(s) and with the stadium location, and to get to know the operational commander(s) at the venue town(s) on the match day(s). for international tournaments, this should take place at least one month prior to the tournament (e.g. by hosting workshops or seminars for key members of visiting police delegations). for one off matches with an international dimension this will be on one of the days prior to the match. Ensuring the safety of all members of a visiting police delegation is paramount and shall be reflected in all organising and visiting police risk assessments concerning police deployment. Visiting members of a police delegation, in particular the Liaison Officer, Operations Co-ordinator and operational police officers (see below) should work alongside local police officers (commonly known as cicerones) who themselves should be serving police officers, preferably with experience of policing football in their own city or country, including familiarity with the venue area and potential risk areas. shall work with the visiting police delegation in a common language agreed beforehand. If allowed in the national legislation of the organising country and subject to the agreement of the organising country intelligence and evidence gathering on behalf of the organising police or for their own purposes. a spokesperson / press officer. The Head of the visiting police delegation can, if considered appropriate, act as a spokesperson and / or have his/her own press officer. The assignment of a Liaison Officer and /or an Operations Co-ordinator should enable an effective exchange of information between the visiting and organising country authorities in connection with a one off football match or a tournament. It is possible for both roles to be performed by the same officer. Whether this is appropriate is a decision for the organising and visiting police to agree on a case by case basis prior to deployment in the organising country. a background knowledge of the situation concerning football related violence / disorder in their country. providing timely and accurate advice to the organising / local police commander. During international tournaments the Liaison Officer is likely to be based in a single or bi-national Police Information Co-ordination Centre (PICC) whilst the Operations Co-ordinator may be based in a local information centre in the area where the match will be played. For one off matches they may be based in the organising country NFIP or other appropriate environment. For a one off match the Liaison Officer/Operations Co-ordinator shall work closely with the police of the organising city. In order to perform their functions effectively the organising police shall provide the Liaison Officers/Operations Co-ordinators with access to the relevant technical equipment. The officers should have experience in the policing of football matches in their own country. are able to communicate effectively during the event to organising country police commanders, via their Liaison Officer /Operations Co-ordinator, information about the type of risk they might pose at any given time and place. Members of visiting police delegations should be able to communicate positive, as well as negative issues concerning their team / national supporters. This will allow the organising country police commanders to make balanced decisions around the need to intervene or facilitate legitimate supporter behaviour. It is important to emphasise here that the primary role of visiting operational police officers is advisory and not operational or decision making. Subject to the agreement of the organising country, visiting operational police officers can also be deployed to gather intelligence / evidence through the use of agreed equipment for use by the organising police or for prosecution purposes in their own country. Maximum use should be made of the support and added value that a visiting police delegation can provide to organising police operations. The visiting police delegation should be informed about the organising police organisation’s operational plan (including their crowd management philosophy and behavioural tolerance levels). They shall be fully integrated into the organising police operation (and given the possibility to attend and participate in pre-match briefing and post-match debriefing meetings). As regards the use of languages, arrangements shall be made in advance by the countries concerned. The organising police and the visiting police delegation shall keep their respective NFIPs informed of developments throughout the operation and submit to their NFIP a post-match report within 7 days. The members of the visiting police delegation shall be shielded from the media unless specific arrangements have been agreed with the head of the delegation. The visiting police delegation should always ensure that their actions do not unnecessarily jeopardise the safety of other persons (6). In case of emergency (i.e. when there is an immediate threat for his/her physical safety) or when it is jointly agreed for tactical reasons, visiting police officer(s) who are not deployed in uniform shall use the standard luminous and distinctive visiting police identification vests, as described in Appendix 3. 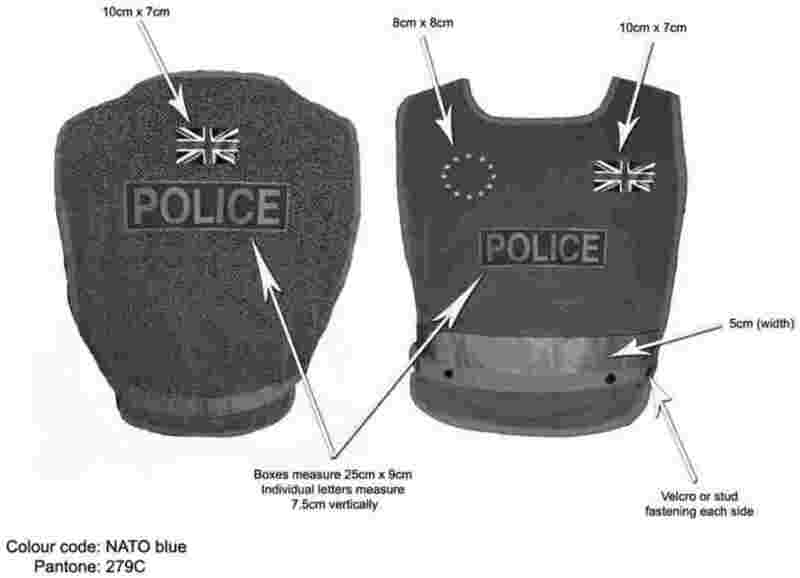 Each visiting police officer shall bring this vest when he/she travels abroad. The police force of the organising country, in consultation with the football organisers, shall ensure that the visiting police delegation has, when appropriate, stadium access and accreditation (seating is not required) to enable the delegation to carry out their tasks effectively. Stewards and other safety and security personnel should be made aware of this at their briefing(s) prior to the game. Countries which have the legal possibility to prevent risk supporters from travelling abroad should take all the necessary measures to achieve this objective effectively and should inform the organising country accordingly. Each country should take all possible measures to prevent its own citizens from participating in and/or organising public order disturbances in another country. The police of the organising country should seek to have available interpreters for the languages spoken by supporters from visiting countries. This could save visiting police delegations from having to undertake this task, which would keep them from actual operational tasks. These interpreters could also facilitate communication between the organising country’s police and the visiting police delegation. The organisers of football matches with an international dimension should do everything in their powers to ensure safety and effective crowd management at the stadium, before, during and after the match, so that the police can be deployed as efficiently as possible. A coordinated approach between all the parties involved is a prerequisite of an efficient strategy for the organisation of football matches with an international dimension. Close cooperation between the organiser, the private partners involved, the public authorities and the police is therefore strongly recommended. In order to minimise safety and security risks the authorities and/or the police should impose on the organiser minimum requirements which they have to meet in order to organise football matches with an international dimension. To this end the Council of Europe checklist can be used (see Chapter 9). The organiser should appoint an individual as being responsible for safety within the stadium (commonly referred to as the Safety Officer). It is important that the police liaise closely with this individual. The police and the organisation responsible for safety within the stadium should work together on a complementary basis, without prejudice to each side’s own responsibilities, competencies and tasks, which are determined by national law and/or laid down or specified in a written agreement between the organiser and the police. Unless determined by national law, this agreement should indicate what tasks shall be undertaken by the organiser and what tasks by the police, focusing on particular on the respective roles of the safety officer and police ground commander, and those of the safety personnel and of police officers. who shall activate the organiser’s emergency procedures. The contents of this chapter should be seen in the context of wide variations in the structure and competencies of justice and prosecuting agencies in Member States. There can be significant benefits from close cooperation between police and justice and prosecuting agencies both in respect of one-off matches and tournaments. Whilst the organising country has sovereignty and jurisdiction to deal with all alleged event related offences, the police and other authorities in Member States and EU competent bodies (e.g. Eurojust) also have a responsibility to assist and support the justice and prosecuting agencies in the organising country. All Member States should ensure that it is possible to deal quickly and appropriately with event-related offences. The organising police and other authorities should inform visiting police and supporters of relevant domestic legislation and / or criminal, civil or administrative procedures together with the maximum penalties for the most common football related offences. Existing multi-lateral agreements on mutual legal assistance (MLA) should be fully utilised for all football matches with an international dimension where appropriate and additionally an organising country may agree bilateral arrangements with any other country for enhanced MLA before, during and after the event. what offences committed in the organising country could be prosecuted in the supporting country (upon the return of the offender). The organising country may invite any other countries to send a liaison prosecutor/judge or other body with prosecutor power to be present during the event. It is recommended that the relevant organising authority, in accordance with the national law including data protection, provides the visiting police delegation and/ or competent agency (e.g. visiting liaison prosecutors) with information from judicial or court records and police or investigative reports, including arrest records, of their nationals. Alternately, a supporting country may agree to have a liaison prosecutor/judge or other body with prosecutor power available on call to travel to the organising country at its request, or appoint a designated liaison prosecutor / judge or other body with prosecutor power for liaison with the organising authority. Within the scope of national legislation the supporting NFIP(s) will attempt to answer promptly requests for further information on arrested individuals, such as details of previous convictions, including football-related offences. All costs related to liaison prosecutors/judges or other body with prosecutor power being sent to the organising country should be subject to bi-lateral agreement. The organising country will provide the necessary means of communication and other facilities for the visiting liaison prosecutors/judges or other body with prosecutor power. Police liaison with supporter groups at national and local level can have a significant impact in minimising safety and security risks at football matches with an international dimension. This co-operation can however be undermined if there is a perception that supporter representatives are working on behalf of the police and for example sharing personal data. Organising police and other authorities should take account of the potential benefits associated with supporter led / supporter related initiatives such as Fan Embassies, Fan Projects and Fan Liaison Officers / Representatives. Visiting police delegations and supporter representatives can help ensure that organising police are aware of the character and culture of the visiting supporters. This should be taken into account as part of the organising police dynamic risk assessment process. Ongoing co-operation and communication between police and supporter groups can help provide a basis for a safe, secure and welcoming atmosphere for all supporters, and can provide a channel for relaying important information such as travel advice, access routes to the stadium, applicable legislation and behavioral tolerance levels. This could also include the provision of an easily accessible contact and information point where supporters could address their questions. 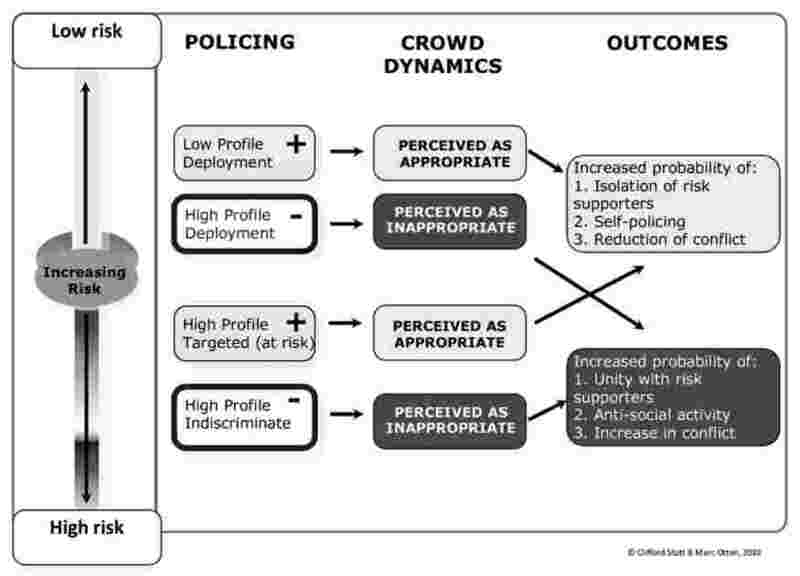 Pursuing this approach has been shown to contribute towards promoting self-policing amongst supporters and facilitating early and appropriate intervention in respect of emerging security problems or risks. An effective and transparent communications strategy is integral to a successful safety and security concept for football matches, tournaments and other sporting events with an international dimension. Organising country policing agencies should, therefore, work closely with governmental and local agencies, football authorities/organiser, the media and supporter groups in the preparation and delivery of a comprehensive multi-agency communications strategy. An effective multi-agency media strategy is a crucial aspect of any communication strategy in terms of providing all parties, notably visiting supporters, with important information such as travel advice, access routes to the stadium, applicable legislation and behavioral tolerance levels. The central aim should be to support a positive image of the event among home and visiting supporters, local communities, the general public and individuals participating in the safety and security operations. This can help generate a welcoming environment for all involved and play a major contributory role in minimising safety and security risks. takes account of the needs/interests of different categories of journalists/media. any other issues of interest. The EU Football Expert meeting can commission subgroups of experts to consider emerging issues in the field of security in connection with football matches and make recommendations. The Presidency shall report to the Council on the result of the meeting. This report replaces the annual questionnaire on football hooliganism required by document 8356/01 ENFOPOL 40. Council Recommendation of 30 November 1993 concerning the responsibility of organisers of sporting events. Council Recommendation of 1 December 1994 concerning direct, informal exchanges of information with the CCEEs in the area of international sporting events (network of contact persons). Council Recommendation of 1 December 1994 concerning exchange of information on the occasion of major events and meetings (network of contact persons). Council Recommendation of 22 April 1996 on guidelines for preventing and restraining disorder connected with football matches, with an annexed standard format for the exchange of police intelligence on football hooligans (OJ C 131, 3.5.1996, p. 1). Joint action of 26 May 1997 with regard to cooperation on law and order and security (OJ L 147, 5.6.1997, p. 1). Council Resolution of 9 June 1997 on preventing and restraining football hooliganism through the exchange of experience, exclusion from stadiums and media policy (OJ C 193, 24.6.1997, p. 1). Council Resolution of 21 June 1999 concerning a handbook for international police cooperation and measures to prevent and control violence and disturbances in connection with international football matches (OJ C 196, 13.7.1999, p. 1). Council Resolution of 6 December 2001 concerning a handbook with recommendations for international police cooperation and measures to prevent and control violence and disturbances in connection with football matches with an international dimension, in which at least one Member State is involved (OJ C 22, 24.1.2002, p. 1). Council Decision of 25 April 2002 concerning security in connection with football matches with an international dimension (OJ L 121, 8.5.2002, p. 1). Council Resolution of 17 November 2003 on the use by Member States of bans on access to venues of football matches with an international dimension (OJ C 281, 22.11.2003, p. 1). Council Resolution of 4 December 2006 concerning a handbook with recommendations for international police cooperation and measures to prevent and control violence and disturbances in connection with football matches with an international dimension, in which at least one Member State is involved (OJ C 322, 29.12.2006, p. 1-39). Council Decision of 12 June 2007 amending Decision 2002/348/JHA concerning security in connection with football matches with an international dimension (OJ L 155, 15.6.2007, p. 76 - 77). European Convention on spectator violence and misbehaviour at sport events and in particular at football matches. Recommendation Rec (1999) 1 on Stewarding. Recommendation Rec (1999) 2 on the removal of fences in stadiums. Recommendation Rec (2001) 6 of the Committee of Ministers to member states on the prevention of racism, xenophobia and racial intolerance in sport. Recommendation Rec (2002) 1 on guidelines for ticket sales at international football matches. Recommendation Rec (2003) 1 on the role of social and educational measures in the prevention of violence in sport and handbook on the prevention of violence in sport. Recommendation Rec (2008) 1 on the checklist of measures to be taken by the organisers of professional sporting events and by the public authorities. Recommendation Rec (2008) 2 on the use of visiting stewards. Recommendation Rec (2008) 3 on the use of pyrotechnical devices at sport events. Recommendation Rec (2009) 1 on the use of public viewing areas at large scale sport events. Recommendation on hospitality principles when organising sports events (not finished yet). 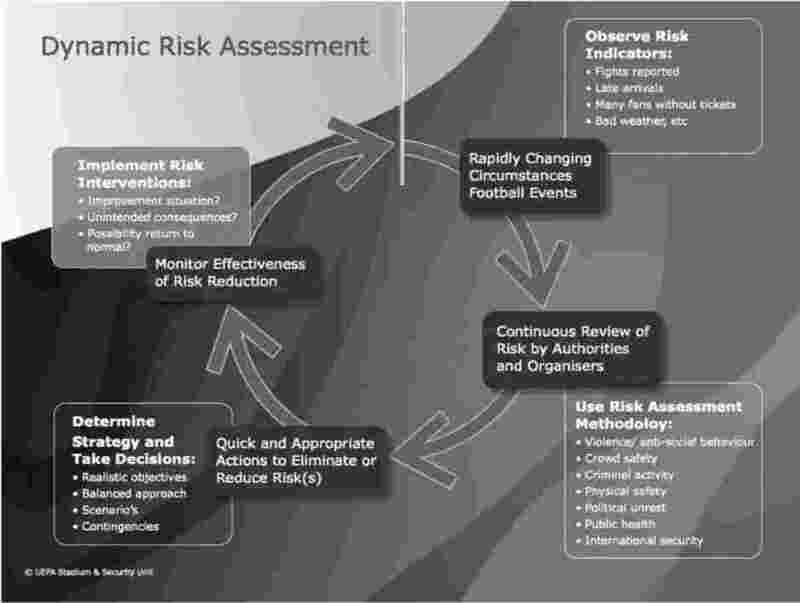 (1) Risk analysis means developing a profile on national and club supporters, including risk-groups and how they relate to other supporters at home and abroad including local population groups and the circumstances which can increase potential risk (including interaction with police and stewards). (2) The NFIP website is a highly secure website available for the exclusive use of NFIPs which contains information relating to football matches with an international dimension (e.g. club overview, pre and post match reports). (3) Council Decision 2008/615/JHA of 23 June 2008on the stepping up of cross-border cooperation, particularly in combating terrorism and cross-border crime (OJ L 210, 6.8.2008, p. 1). (4) See Appendix 2 for details on the timeframe to request Europol products and services. (5) Council Decision 2008/616/JHA of 23 June 2008 on the implementation of Decision 2008/615/JHA on the stepping up of cross-border cooperation, particularly in combating terrorism and cross-border crime (OJ L 210, 6.8.2008, p. 12). (6) See Articles 21 & 22 of the Prum Council Decision on civil and criminal liability. the following considerations should be applied to the assessment of risk to safety and security before, during and after the event. a ‘low profile’ or ‘graded’ tactical approach to policing that enhances police capability for communication, dialogue and dynamic risk assessment. if it is necessary to impose limits on supporter behaviour, it is important to communicate with those supporters why police action has been taken and what alternative means the police are putting in place through which legitimate aims can be achieved. therefore, to help decrease the likelihood and scale of incidents, it is critical that risk assessments are accurate and inform police tactics at all times. it is inappropriate to act against a whole crowd who happen to be present in a given location, unless there is evidence that they are uniformly seeking to provoke disorder. it also allows the police to communicate concerns regarding supporter behaviour, risks they may face and solutions to any emerging difficulties. any circumstances likely to impact on the behaviour of, or risk posed by, those supporters or groups perceived to pose a risk to public order. Behavioural tolerance levels should be defined and priority given to communicating these to supporter organisations. Consideration should be given to encouraging supporters to gather in a safe/controlled environment (e.g. a fan zone). Based upon this information and intelligence relating to the specific fixture it should be possible to predict and distinguish fixtures with normal risk and increased risk to public order. It is important to clearly distinguish between risks for specific types of incidents, such as public order, public safety, criminality in relation to mass events and terrorism. Since the level of risk to public order is not fixed but highly dynamic it can increase and decrease rapidly in response to circumstances. The levels of risk must therefore be monitored and accurately assessed on an ongoing basis. interventions units (i.e. ‘riot squads’ with protective equipment, vehicles, etc) should be kept in discreet locations unless the situation determines that a more forceful intervention is required. This will assist the organising police gather information and inform command decisions regarding tactical deployment on the basis of continuous and ongoing risk assessment. where an incident involves visiting supporters organising police assessments should be validated by the visiting police delegation. those not posing any risk should be allowed to leave the vicinity and / or some time to impose ‘self-policing’. once the incident(s) has been resolved policing levels should return to an appropriate level. a through debrief should be conducted and any relevant information (e.g. the quality of information received before and during the event, the behaviour and management of supporters, police tactics and the enforcement of tolerance levels) must be recorded with the NFIP. (1) Europol Support to Member States – Major International Sporting Events (Europol file number 2570-50r1). (2) The starting date of the event. Single word: POLICE (in English only) with a box border - to be positioned in the centre of the vest both front & back. POLICE letters and border: Nato Blue background. Both letters and the surrounding box to be luminous silver. Left Breast (above POLICE box): National Flag 10 cm × 7 cm - embroidered/sewn on or in a plastic sleeve. Below the POLICE box should be a luminous silver band across the front of the vest × 5 cm wide. National Flag above POLICE box: 10 cm × 7 cm. Below the POLICE box should be a luminous silver band across the rear of the vest × 5 cm wide.